You’re new to indigenous American spiritual traditions. You need a good reminder that being human is complicated. You’re interested in alternative views on the path to enlightenment. The Four Agreements is a book that lays out an alternative, indigenous Mexican take on the nature of reality and existence. And though the author, Don Miguel Ruiz, identifies as “Toltec“, a broader label of neoshamanistic is probably more realistic. In any case, the mythology he introduces is page-turning, his writing is powerful and his treatment of the illusory nature of reality is lucid and compelling. 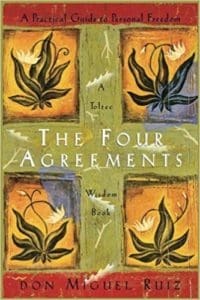 If you’re already steeped in Western or Eastern philosophy The Four Agreements is a good (short) read that casts familiar truths in new and enjoyable forms. If you’re new to philosophy of any kind, exploring neoshamanism or just looking for a good spirit-lifting read, The Four Agreements is as good a place as any to begin. Your world is made up of labels, concepts and beliefs. But these labels, concepts and beliefs are illusions. You are living in a dream. This dream has been programmed into you using words; through a training process that began the day you were born. Words that came from your parents, your teachers, your communities and your peers. Words that grew into the labels, concepts and beliefs that define the rules and the boundaries of your reality. But this dream isn’t soft or harmless – to you, its illusions are as real and as tangible as the laws of physics. They are the rules that tell you about yourself and the people around you. They are the rules that tell you how things “are”, should or must be. They help you find order in chaos. You agreed to most of these rules, even though you aren’t responsible for them and even though you didn’t really check them. And some of them are useful. But many of them are also inaccurate, unrealistic or unattainable. They trap you like a fly behind glass – unable to see past the fabric of the dream that constrains you. The most harmful of these agreements reinforce that you are never enough; that you are constantly falling short of some whimsical ideal. The result? The agreements you have made, knowingly and unknowingly, are the fundamental source of suffering and striving in your life. Worse, they make you a vector of suffering in the world around you. And yet you hold on to them. Partly because you aren’t aware of how arbitrary they are. Partly because you don’t have any alternatives. Mostly because they make you feel safe. And safety, even if it brings suffering, feels better than throwing your world into chaos. IT IS POSSIBLE TO WAKE UP. But it is possible to wake up from this dream. It is possible to re-engineer your reality without the endless striving, without the suffering. Action – Dissolving and shaping your dream, and the dreams of others, into forms of your choosing. This “second awakening”, this end of suffering, is a state oft described as “enlightenment”. THE JOURNEY STARTS WITH AWARENESS. Simply reading and understanding the truths above is a first step to freedom. But any awareness you now feel will fade, fast. Instead of rising above the dream and working on it, you will soon sink back and be sucked into it. Perhaps as soon as you stop reading this article. Improving your ability to maintain a heightened state of awareness is the only true gateway to enlightenment. Many paths lead to such states of elevated consciousness. Prayer and fasting are common paths in most religions. The Buddha laid a clear path of meditation and mindfulness. Indigenous American shamans (among others) perfected their own path with a plant-based tradition that “accelerates” the journey through altered states of consciousness. Though he alludes to it in his final ‘Toltec Pathway to Freedom’ (The Initiation of The Dead), The Four Agreements greatest weakness is that Ruiz didn’t (or couldn’t) plainly state the crucial importance of this plant-based tradition in neoshamanism. The result is a good description of “What” awakening looks like, but little real guidance on “How” to get there. Whatever path you choose, the importance of training consciousness in “awakening” cannot be overstated. It is a fundamental prerequisite to all that follows. With awareness and understanding comes forgiveness. Forgiveness for our past and ongoing ‘failures’ against agreements we still hold. Forgiveness for causing ourselves and those around us to suffer based on those illusions. Forgiveness for the suffering others cause as a result of their illusions. This forgiveness, this unconditional acceptance, is at the heart of true, universal love. The delivery of this one idea alone, through a carefully kindled window of awareness, is perhaps the greatest triumph of The Four Agreements. Grasping it, even for a moment, will lift a crushing weight from your shoulders. A weight you may have long since forgotten you carry. You will fail to live up to your expectations; and so will others. You will make mistakes; as others will too. But being human is complicated. We are all the products of the illusions that make up our realities. Acknowledge that reality, accept yours and forgive yourself, and others – “for they know not what they do”. FROM FORGIVENESS COMES THE STRENGTH FOR ACTION. Programming new agreements that slowly eliminate suffering. 1 – Be impeccable with your word. Words are more powerful than we realise, they are the building blocks of labels, concepts and beliefs. To avoid creating new, harmful illusions, be extremely conservative when using them on yourself or on others. Get in the habit of saying only what you mean and meaning only what you say. When in doubt, say nothing at all. Remember that the words and actions of others are the products of their own illusory realities. Acknowledge that if you shared the same reality you would know no better than to act and speak in exactly the same way. Armed with this knowledge: take nothing personally. It will defuse the power of the words and actions of others to impact you. Though we know most assumptions are baseless, we often still give them the weight of full agreements. The result? The violation of one-sided expectations is a major source of misunderstanding and suffering at all levels of life. Be aware and wary of your natural tendency to assume things about yourself, others and the world around you. Instead, look and listen without labels or judgement. Have the courage to ask questions and clarify. And remember, when someone or something surprises you – the failing isn’t theirs, it is yours. Always do the very best you can. Live with maximum possible areté in each moment. But don’t worry about whether your best now is the same or better than your best yesterday, or even five minutes ago. Instead, accept that your best will change from moment to moment – depending on the conditions within and around you. Now, do what you can, with what you have, from where you are – you can ask nothing more of yourself. Though The Four Agreements is strong on “Why” and “What”, it is sadly anaemic on “How”. His contributions under the first two can be loosely summed up as: “Become aware of the agreements that dictate your reality and have the discipline to change them.” You might squeeze a little more out of his writing, but not much. Unfortunately, his pointers on getting there don’t extend far beyond a well crafted “Just do it“. Why Ruiz came so far only to abandon us at the most vital part of his teaching I don’t know. But in all three cases, those looking for more would probably do best to find a good teacher of indigenous American spirituality or explore other paths (like meditation) with large and easily accessible bodies of practical literature. As with similar books, The Four Agreements is better enjoyed first-hand than summarised. This is especially true for crunches (like this one) that are more synthesis than summary. Why? Because so much of their power lies in the author’s own voice, in Ruiz’s skilful ability to lift us, if only for a moment, above the thick smog of life to glimpse the blue sky above it. If what you read here today struck a chord, I’d strongly recommend picking up the original book. At only 153 sides, it packs plenty of impact per page. The Four Agreements by Don Miguel Ruiz is a self help book and I really learn a lot of things. I appreciate your efforts, you write summary in good style. Thanks for sharing. Thanks, Danyal. It’s always harder to summarise books like The Four Agreements. I’ve read and re-read Tolle’s The Power of Now several times thinking about how I’d tackle it in a summary.